Unwanted hair can e quite embarrassing sometimes. Many people who have this problem struggle with trying to find an effective treatment. There are products you can buy to remove hair from different parts of your body. The TRIA Beauty Hair Removal Laser is one such product. It is actually approved by the FDA as the first, and only, laser hair removal device available for home use. Let’s look at another product. If you are a guy, and you have a forest growing on your back, you may wish to occasionally remove that unwanted hair for outdoor, beach or related activities. In that case, you will find this neat little gadget quite handy. There are quite a few other products for hair removal as well. In addition, there are numerous home remedies which internet postings claim have produced results. Be careful and use your common sense. If it were that easy, pharmaceutical companies would have refined those home remedies into a viable product and marketed them to the public. You decide. Here’s one home remedy to remove unwanted hair that is described as an important health and beauty tip. 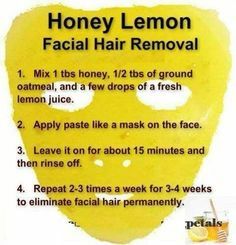 “When mixed with honey, sugar and lemon juice make an effective hair removal wax.” Just like a salon wax, this process can be slightly painful, but it also is supposed to give better and long lasting results. In the pubic area, many people may not want to remove all the hair but only have a clean bikini line. In that case, going for a bikini wax is a good idea. Though you may find DIY kits in the market, it may be better to go to a salon than try do it yourself. Why? Well, working in between your legs can get quite difficult. Unless you are a contortionist, it can be very awkward trying to get the right angle. It can be more painful too. If you decide to go to a salon, make sure you use a salon which is hygienic and one which uses disposable waxing strips. Let the lady know if the wax is too hot for your skin. You may experience redness even after the treatment is over. If your skin is too sensitive, apply a cold compress (ice) to soothe the area and wear comfortable innerwear. Properly done, the hot wax treatment will leave your skin feeling soft and smooth for weeks after the initial pain. There are the different types of wax for the bikini area. How do you determine which ingredients to try at home? Turmeric is a very ancient herb with lots of medicinal qualities. It is also great for skin. Nettle also has great qualities; however, it can itch the hell out of you. It is claimed that nettle and tumeric powder mixed together is a good home remedy for removing unwanted hair. However, others say this this just isn’t true. Keep in mind, natural home remedies will take longer to show the claimed results, so a bit of patience is required. But the payoff is that, if they work, since there are no chemicals in these natural ingredients, there are no side effects either. As you know, chemicals in many creams can cause irritation, allergies and darkening of the skin. Some even claim that, “White pepper and camphor cause a burning sensation when used on sensitive skin, but don’t worry, this just means it’s working.” Some even recommend using kerosene with this method, but don’t do it. Kerosene is highly flammable even in small amounts. You can burn or blow yourself up. And kerosene will blister or otherwise damage your skin instead of repair it. In conclusion, there are many home remedies out there for removing unwanted hair. There are also many advertised products and gadgets for doing the same.If you try one of the home remedies, you’re on your own. But beware of things which sound too good to be true. Check out what the FDA has to say on the subject. While they recommend consultation with a healthcare professional, the FDA also offers some tips related to the most common methods of hair removal. Lasers effectively destroy hair follicles. However, the skin numbing creams associated with those treatments can cause health complications. Also, you can remove unwanted hair with electrolysis because electrolysis also destroys hair follicles. According to the FDA, “Electrolysis is considered a permanent hair removal method, since it destroys the hair follicle.” However, there can be potential associated risks from scarring. Here are some devices which should be explored for their potential success in removing unwanted hair. 3 Easy Ways to Get Rid of Unwanted Hair (with Pictures) 1970, Viewed 13 August 2016, <http://www.wikihow.com/Get-Rid-of-Unwanted-Hair>. 6 Ways To Naturally Remove Unwanted Body Hair Permanently 1970, Viewed 13 August 2016, <https://www.positivehealthwellness.com/beauty-aging/6-ways-naturally-remove-unwanted-body-hair-permanently/>. Hair Removal 101: What’s the best way to remove unwanted hair … 1970, Viewed 13 August 2016, <http://www.discovergoodnutrition.com/2013/12/hair-removal/>. Jeffrey Traister 1970, Ways to Remove Body Hair Permanently at Home | LIVESTRONG …, Viewed 13 August 2016, <http://www.livestrong.com/article/206979-ways-to-remove-body-hair-permanently-at-home/>. MHT Sara 1970, 16 Amazing Home Remedies for Unwanted Hair Removal, Viewed 13 August 2016, <http://www.rapidhomeremedies.com/remedies-for-unwanted-hair-removal.html>. Remove Unwanted Hair Permanently At Home 1970, Viewed 13 August 2016, <http://www.myhealthtips.in/2014/11/remove-unwanted-hair-permanently.html>. Threading, waxing or laser 1970, Viewed 13 August 2016, <http://www.thehealthsite.com/beauty/how-to-get-rid-of-unwanted-hair-on-the-face-body-bikini-area/>. can i use this home remedies on pubic hair..?